What does the x-ray reveal about this painting? Place your mouse over the x-ray tab to see what is behind the landscape. 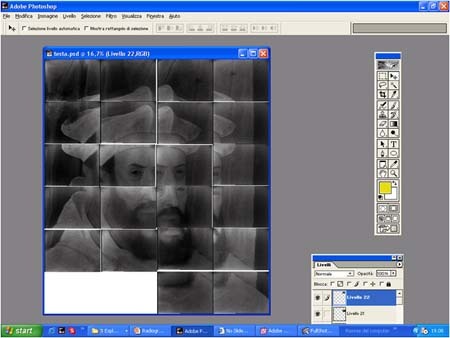 X-rays play an important role in revealing an artist’s techniques, pigments, and underpaintings. 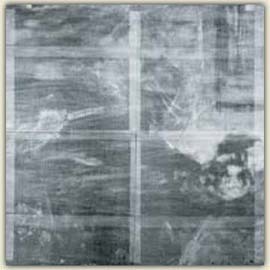 X-ray film primarily records the structural elements of a painting, including the dispersion of lead white, the principal white pigment used for centuries by painters. An x-ray can also easily spot repaired tears on the canvas, holes in the panel support, losses in the ground layers, and cut down edges and transfers. An x-ray can also reveal a painting hidden underneath the visible painting. Sometimes, an artist reused canvasses or supports, and forgers sometimes employ a period panel or canvas as part of their trickery. What don’t you see in the painting at the left? 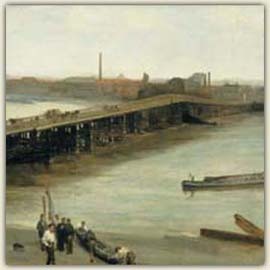 James Whistler’s seaside landscape conceals a vertical portrait, visible only through the use of an x-ray. Is this Islamic glazed ceramic jug an authentic piece or a fake? See what the x-ray reveals. A complete and undamaged fragile ceramic is a collector’s dream. Only an archaeologist is interested in a bag of shards. That’s not true for forgers! They can really appreciate the financial potential of few shards. 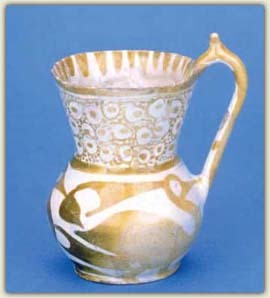 Look at this beautiful Islamic ceramic jug. Is it intact? 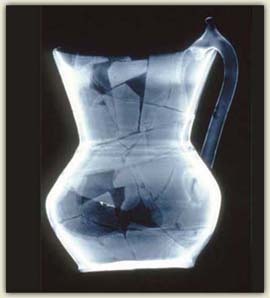 With an x-ray, it’s quickly apparent that the jug has been reconstructed from shards. Note that the handle and much of the rim are made from a more transparent material. The radiographic image is determined by the x-ray absorption of painting components (pigments and support), and by their concentration and their thickness. Indeed, pigments containing metals with a high atomic number Z (number of protons in the nuclei) absorb x-rays better than pigments with low atomic number metals or without metals in their formulae. So, for example, the pigments that are most likely to block x-rays are those made of lead: lead white (lead Z=82), chrome yellow (lead chromate), Naples yellow (lead antimonate) and minium (lead oxide). Those pigments with weaker absorption power have lower Z elements, such as zinc white (zinc Z=30), cadmium yellow (cadmium Z=48) and emerald green (arsenic Z=33). Very weak absorbers include lime white (calcium Z=20), umber (manganese Z=Mn, iron Z=26), cobalt blue (cobalt Z=27), red/yellow ochre (iron Z=26), Prussian blue (iron Z=26). The worst absorbers are the organic pigments based on carbon (Z=6): carbon black and carmine lake. 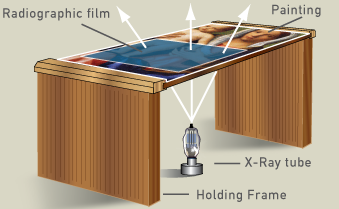 In order to make x-ray radiographs of a painting, a frame must hold the painting from its edges. A sheet of radiographic film is placed against the paint layer to produce the sharpest image of the artist’s working techniques, and light from an x-ray tube is directed to the film from beneath the painting. Unlike other imaging techniques, radiography is not a photographic procedure. Rather, it is a clinically-based diagnostic technique using electromagnetic energy found beyond ultraviolet light in the spectrum. 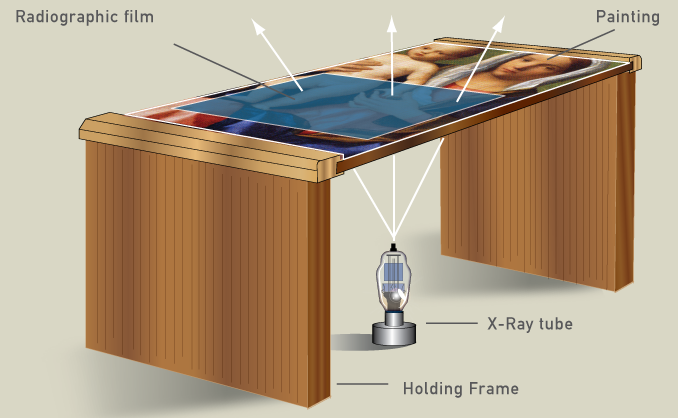 Paintings are normally shot at exposures far lower than medical x-rays, and the low dose of electromagnetic radiation does not hurt or alter the painting materials. Precautions are necessary, of course, to protect the operator and secure the zone where the machine is used. Conservation facilities are subject to state inspection and they must receive licenses to operate radiographic equipment. Radiographic sheets are only a bit larger than a printer page. Therefore, several sheets of film are used for larger paintings. These sheets are digitized and developed into a single image with image processing software.